The smell that always makes me breathe deep, wrap my arms around myself, and sigh in delight is, oddly enough, the smell of freshly mowed wild onions. Nothing smells more like spring, not the Bradford Pears or the warm air. It’s the tart, stinky smell that makes it seem like the world has come alive again. So it is no wonder, knowing that stinky onions equate spring for me, that I love ramps so much. 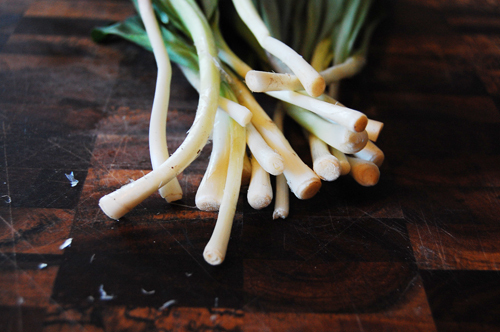 Ramps are a member of the onion family, a long leafy green attached to a small bulb. They grow wildly and are most easily found in the woods (if you know where to look) or at your local farmers market. While there are many things to do with the bulbs (pickle them, saute them, etc) I threw mine in the freezer for future use and focused on the greens. Like most pungent flavors, I find that ramps pair nicely with cheese, and in the form of a bread. I’ve had ramp scones and ramp muffins, ramp cornbread and ramp sourdough, but I think that these ramp biscuits have been my favorite variant yet. I served them with a fig jam (which by the way was amazing and got me so jazzed for figs to be in season that I cried a little in anticipation of the summer months) which was the perfect pairing. The sweet jam played off the ramps in a fun way, and it all felt very spring. I suggest you make them. 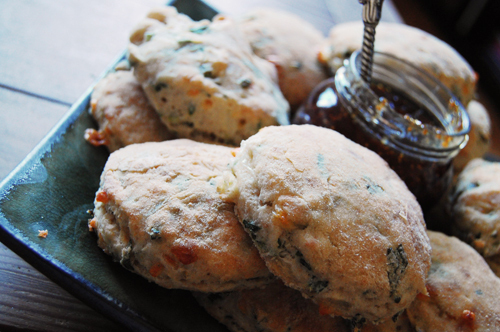 Go forth to your local farmers markets, pick up some ramps, and make biscuits! Lots and lots of biscuits! Preheat the oven to 475(f). 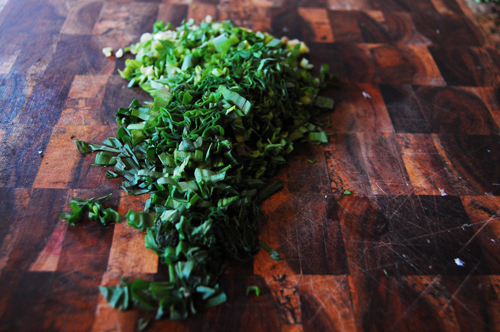 Whisk together the dry ingredients, the cheese, and the ramps. Use fingers to incorporate cold butter. With the butter, you really just have to knead it with your fingers until the mixture has a course texture, like corn meal. Pour in cream. Stir (preferably with a wooden spoon) until dough forms. 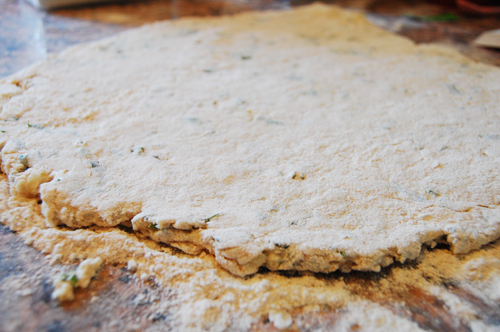 It’s okay if the dough is a little sticky, you’ll work it out on the countertop. I’m excited to try this right now! I just gathered about 4 lbs of ramps from my recent trip to WV and love trying new recipes with them!